Jesus’ Resurrection: Don’t We Know Better Now? EDITOR’S NOTE: Jesus & Dawkins welcomes guests posts. Today’s entry comes from Michael Shenigo-Rudy, a senior at THE Ohio State University. He’s the president of Ratio Christi at OSU. I encourage you to submit a comment after reading his great piece! Within the Christian faith, there are a formidable number of doctrinal beliefs that strike many intellectuals as false. The belief in Christian particularity, meaning not all persons experience salvation, is oftentimes considered barbaric and offensive. The theological doctrines of both the Trinity and Incarnation, with their vast history of creedal and metaphysical explanations, have left many thinking such enterprises are hopeless in advancing beyond overly complicated at best, and incoherent at worst. Interestingly enough, the very core of the Christian Gospel itself—the resurrection of Jesus from the dead—is in fact one of the most commonly addressed and debated doctrinal elements. From almost all the disciplines in academia these days, whether it’s professionals in the sciences or those doing historical inquiry, a reactionary lament has become tightly associated with the claim of Jesus’ resurrection. It can be roughly summarized as, “that never happened since we now know today that dead people do not rise from the dead.” A brief skimming of virtually any non-Christian historical study of Jesus will find such a sentiment clear and axiomatic in regards to understanding what happened on that Easter Sunday. Yet this attitude permeates not just the halls of the academy. It’s also quite common amongst the culture at large—especially in the post-Enlightenment West, which lives in the wake of Hume and his endeavor to show the impossibility of knowing about miraculous events happening at all. While it is not this author’s intention to provide a robust historical case for the resurrection, or to show the possibility and coherence of miracles, I do seek to challenge the idea that “we now know dead people stay dead.” From this argument, I reach a conclusion that will benefit how both Christians and unbelievers understand one another’s assumptions. Contrary to several common assumptions about early Christian faith and practice, the idea of a dead person rising again to life was seen as being quite problematic for both the culture at large and even for some of those within the Christian movement. A thorough reading of Greco-Roman and pagan literature before, and contemporary with, the early Church is illuminating: it conveys a cultural milieu that found the notion of a dead body coming back to life again to not only be impossible, but downright unappealing, given the prevalence of Platonic dualism! It wasn’t people’s prejudices against the supernatural that prevented ideas like resurrection from being plausible in those days. The commonly-held beliefs about the nature of souls and bodies ruled it out as ever being possible in the first place. The New Testament itself displays just how difficult it was for even Christian believers to swallow the idea that their bodies would be resurrected one day like Jesus’ body. Paul, in one of the most tightly argued passages within all the Bible, spends an entire chapter of 1 Corinthians trying to convince Christians that bodily resurrection is reasonable and possible. The amount of literature pertinent to discussing and defending the resurrection’s coherence is vast. From pagan critics of the Christian faith, to the early Church Fathers, Christianity’s core doctrine has caused fierce debate since the beginning. In light of all this information, it becomes quite clear that the resurrection of Jesus has always been a controversial topic, not only because its many theological implications, but also for its very plausibility and coherence as well. When the criticisms of today are compared with those of times past, we discover that the plausibility of Jesus’ resurrection has always been questioned. While several treatments about the historical veracity or metaphysical meaning of Jesus’ resurrection can inform both believers and nonbelievers, I do think this insight has been at times overlooked and underappreciated by both groups—to their own impoverishment. Yet in acknowledging the presence of such a factor, I believe both groups can enrich their understanding of the other’s convictions. For Christians, it is imperative to realize that despite several painstaking attempts to provide a rational basis for belief in the resurrection of Jesus, it will forever remain a counterintuitive explanation of how the world really works. For nonbelievers, it’s helpful to realize that Christians do (or at least should) see just how extraordinary, and even implausible, their assertion of Jesus’ resurrection really sounds. For that is the way it has been, and always will be, seen. I think that the main reason atheists are atheists is they don’t find compelling evidence to back up the extraordinary claims made by Christians. One (of many) being the resurrection of Jesus. Basically, Christians believe stuff that is too fanciful to believe due to a lack of evidence. How does the conclusion “Christians think this stuff is hard to understand too” bridge any gaps or help atheists comprehend Christians better? On the flip side what’s the message to Christians here? That the resurrection of the dead is a tough pill to swallow and should be recognized as something outside of rational explanation? Isn’t that what a miracle is? Are there Christians who don’t think Jesus’ resurrection was a miracle? What atheists lack is not evidence. What they lack is the cognitive capacity to stop making up the rules as they go, and instead let the information be what it is. They lack creativity, imagination, and a sense of wonder when dealing with the ideas that they idolize. They lack humility, and are very strong in arrogance. They define the parameters of how the information should arrive to them, and if it doesn’t suit their fancy, they call it, “a lack of evidence”. There’s plenty of evidence, but not the decency to admit that they simply don’t have the heart to believe something is true or not. Instead of admitting that the information is there, they chalk it up to bad science, as though they are the officiators of what is good and bad science. They’re absolutely useless minds produce nothing toward human consciousness, and it’s only a matter of time before the atheistic community stops cutting off their nose to spite their face, and start listening to their brothers and sisters that are telling them the truth. They are nothing more than bullies, who’ve taken over the baseball park just to kick around the dirt, and mock the other kids in the neighborhood who aren’t allowed to play there. Joe Bob and Onewitness, thanks for the comments! First, I hope we can have a civil conversation and assume everyone has good intentions. Onewitness, I appreciate your passion, but your sweeping generalizations are unnecessary and uncharitable. Second, I think Rudy challenged the “we NOW KNOW dead people stay dead” idea by acknowledging the first Christians’ difficulty accepting Jesus’ resurrection. The message for atheists is that accepting the resurrection was just as hard 2,000 years ago as it is today. Therefore, it’s lazy to mock contemporary Christians for uncritically accepting an obviously false fairy tale. Atheists can absolutely say they doubt it, but they shouldn’t assume the first Christians were ignorant of how death usually works. I encourage EVERYONE to watch a two-minute video of a great New Testament scholar and theologian, N.T. Wright, covering all of the questions raised in this thread. The hope here is that weeding out false assumptions helps dialogue between Christians and atheists. If we can appreciate the historical context of Jesus’ alleged resurrection, perhaps we can have better conversations that ask deeper questions, like N.T. Wright says. No need to address Onewitness’ comment as I don’t really see anything in the way of argument just some conclusory generalizations about atheists. Master Lehman thanks for your response. I enjoyed the N.T. Wright clip and greatly respect his work generally. He is a first rate mind who is quite thoughtful and thorough. Two of my favorite qualities in folks of faith. I do take issue with some of what you said. First, you said “[t]herefore, it’s lazy to mock contemporary Christians for uncritically accepting an obviously false fairy tale.” Well it depends. Let me say that I don’t think mocking is ever really useful, especially when it comes to someone’s deeply held beliefs. I don’t see how the proposition “it was hard to accept the resurrection 2000 years ago, just like it is today” somehow forecloses atheists from thinking the resurrection is an obviously false fairy tale and that Christians shouldn’t believe it. Whether the Christian arrived at the belief uncritically or the faith was hard-won through lots of internal struggle how/why does that affect the underlying veracity of the claim? But the piece was not about that. It was about how understanding that early christians found the resurrection hard to believe somehow builds bridges and will facilitate dialogue. Somehow understanding the “historical context of Jesus’ alleged resurrection” will bring the two sides together. I guess I don’t see the divide being about a lack of understanding of the historical context it is the FUNDAMENTAL DISAGREEMENT about what that context is. A guy who was dead and then came back to life? Or something else? Whether or not the early Christians thought people came back to life doesn’t seem to address the fundamental disagreement there. Maybe this does in fact weed out false assumptions I just don’t really see it. Hi, Joe Bob. Thanks for your thoughtful reply! I’m glad you liked the N.T. Wright video. Regarding your first point, I don’t think this post affects the resurrection’s veracity. Finally, I don’t want to say this post will bring the two sides together, or that it’s even about their fundamental disagreement. Instead, this post plucks one small weed from the dialogue: 1st century people knew that dead people stay dead. In fact, the early Christians had an AWFULLY difficult time accepting the resurrection. In this way, we see that contemporary atheists and disciples like “Doubting” Thomas have much in common. And that’s a big compliment. Thanks for your reply. I’ll check out that post. I really enjoy your site by the way. I don’t mean to come off as antagonistic I just want to raise and press on some issues. Also, to the author of this piece I don’t mean to say you did a poor job or it was not well written. You are clearly a bright person who should keep thinking and writing about these issues. Joe Bob, I think the scope you’re discussing is possibly greater than the scope of the post… The post is saying that modern science hasn’t come to prove that the resurrection is impossible. It was thought to be every bit as impossible the day it happened 2000 years ago. The evolution of science has done no more to prove that the dead stay dead. I think that the post, and Mike, are trying to say that modern science has not done any more to disprove the resurrection. The resurrection was not something that could be proved with any human knowledge when it happened, and it is not something that can be proved now. The Bible makes no attempt to say that this is something that we should be able to prove – there are only two instances of someone arising from being dead in the Bible. And one of those two instances resulted in that person (Lazarus) winding up dead again. I would agree. We’ve made basically zero advancement towards proving that things can’t come back to life. And I think the point behind that is that a modern Christian should not feel foolish in the face of modern science. Modern science has concluded nothing additional on the subject. Medical science is based on documented cases. If even the Bible cites only two cases in history, neither of which were evaluated by medical science, there’s nothing to go on. Furthermore, science has actually gone in the direction of coming to the conclusion that there is nothing inherently irreversible in death. Unless science discovers a soul or that there are quantum processes in our neurons that cannot be re-started once stopped, basically the scientific view is that we are walking biological robots with biological computers in our heads. As far as science is concerned, we are increasingly looking like a mass of firing neurons, which creates our entire personality and everything we do and think, which all amounts to simple chemistry and the physical layouts of the neurons. All of which could be restarted if the damage caused in dying was not too severe. Though we have found that there is damage created by re-oxygenating tissues after blood flow stops and things like that, which would all have to be avoided. So really, modern science is suggesting a person could potentially be ‘restarted’ – but that it never happens on its own. Either way, 2000 years ago no one ever rose from the dead. That was known. And 2000 years later no one still has and science still asserts that no one could just jump back to life of their own accord and without some serious medical equipment and science (in the event that the brain can be switched back on after death, of course). So a modern Christian should not feel any more foolish than an original Christian. Not to imply that others can’t assert a Christian is foolish based on science, but only to say that nothing has changed there. The resurrection hasn’t become a more foolish belief over time. Well that is one way to look at it. The other way is to say we’ve made zero advancements toward proving that things CAN come back to life. Therefore, a modern Christian should feel as foolish now as the Christian in the year 1500, 500, and whenever Jesus came back to life. They may not feel foolish AT ALL because they have faith and enough evidence to make them feel secure. However, those are two separate issues, faith + the modern scientific understanding of death. Someone’s faith is their own and they can come at it however they want. Modern science would say that certifiably dead people (like Jesus was on the cross w/ a spear in his side) don’t come back to life. There’s a reason why we bury people in the ground and modern graves don’t have doors. We all seem to be about as sure as we can that when someone dies we can cut them up to harvest their organs, burn them, bury them, etc. So despite the fact that you are saying that we as a society have “made basically zero advancement towards proving that things can’t come back to life” we are AS SURE AS WE ARE ABOUT ANYTHING ELSE IN THE PHYSICAL WORLD that when people die they don’t come back. I don’t see how that bolsters an argument for Jesus’ resurrection. Modern science hasn’t disproved that the dead come back from the grave EVEN MORE therefore the argument is somehow still legit? Since science is 99.9% sure dead people don’t come back to life but they haven’t taken that extra leap to say we are 99.99% sure that gives credence to the view that a miracle happened that day? I think you can argue for the resurrection of Jesus. However, I don’t think you can point to modern scientific understanding as something that HELPS the argument. Maybe this is just my bias that trying to prove God and Christianity using science and rational thought seems like a fools errand. Faith is faith and it’s something you decide to have. I may be a Christian but I may also think that there is little to no evidence that the events of the bible happened. I just choose to believe in Jesus due to nebulous spiritual notion I can’t quantify. The only rationality in there is my choice to believe. In fact, this choice seems to require EVEN MORE faith than someone who says they came to Jesus through studying apologetics and whatnot. More faith = better right? I guess this article might give some comfort to Christians (‘you’ve always been thought a fool by the non-believer!’), but I don’t see it bringing much to the Atheist who is not of the Dawkins breed. By that I mean one who is not trying to positively disprove religion. As a “soft” Atheist, I am apathetic to all extraordinary claims that are not accompanied by evidence; however I personally find it wrong to then judge the believer. Should I wander into a jungle and find a people worshipping ghost leopards that no one can actually show me, I wouldn’t think “what a bunch of dolts”. There are probably good historic and evolutionary reasons for their beliefs. Similarly, I fully respect the tradition and moral implications of the history of all religions and don’t wish them away. That said, for those people in the modern world who actually care enough to get this deep into the conversation, it is puzzling to me how they can sustain a belief in the supernatural. I don’t think they are stupid, many are clearly not. I just don’t understand how they reconcile their belief with reality. If one is endeavoring to find “truth” in the human condition, it becomes quickly clear that two opposing religions can’t be true at the same time. Thus, faith and belief don’t help me much in deciphering these questions as one claim is as valid as the next without evidence. Clearly belief in religion is a truth of the human condition, so I don’t judge them for believing. However, unlike the primitive in the jungle, it is difficult to give weight to someone’s opinions who on the one hand accept the comforts that the scientific process affords them (TVs, cars, modern medicine, etc.) and yet rejects that process when trying to understand the most important questions. Again, I don’t judge religious people for their beliefs; I actually think I am the more unnatural one for not having them. However, I also don’t have the time or interest to take seriously any given supernatural claim. Their may be an elephant in the trunk of your car, but until you provide some evidence, it is a silly discussion to the Atheist, even if you have a rich tradition of believing elephants live in the trunk of cars. It is this dismissiveness I believe that annoys religious people when interacting with Atheists. For me it doesn’t come from a place of judgment of intelligence, I just don’t accept faith as a means for explaining reality so those arguments are void to me. It doesn’t mean that person might not know a great place to eat dinner, or give good parental advice or solve a difficult problem at work. There is a correlate to this for the feelings Atheist have towards believers. There is a superiority implied when the faithful pity the non-believer for not seeing what to them is self-evident. N.T. Wright displays it in the video when he says that once you believe, all the evidence falls into place. If we Atheist could just become biased, then all the confirmations would follow. Once as a young man when on mushrooms, all of the world in every aspect, including all the events in my life, seemed to add up and make complete sense to me at that moment. However, I don’t worship mushrooms. Hmm. I understand your point here. It could seem hypocritical to accept the scientific process for some things but then not rely on it for other things. However, I’m not sure that’s the right way to view it. One could argue that these things are apples and oranges. Applying the scientific method to physical quantifiable things such as the components that make up a TV, car, modern medicine may make sense while ONLY relying on the scientific method for things like the existence of God or the supernatural. You could say well if you can’t rely on the scientific method and rationality how can you make heads or tails of anything? That’s how we process and deal with information and form opinions, beliefs, etc. By virtue of making a choice to believe one thing over another (in Jesus v. Buddha v. ghost leopards) you are using the scientific method. I get this argument. It makes perfectly good sense. However, I don’t see how this necessarily excludes an appeal to faith or something spiritual. I am VERY DUBIOUS of folks who say they can prove Jesus using logic, science, math, hard evidence whatever. If someone says I believe because Jesus works for me, I’ve had a number of enriching spiritual experiences following Jesus, my life is greatly improved, etc. I think that’s great. I believe my eyes when they tell me something, why not believe my “spirit” or whatever you want to call it whenever it tells me something as well? I can understand if you think that is just silliness. By this logic, how is a belief in Jesus any better than a belief in ghost leopards or a tea kettle in the sky? You’re right about this. It seems that Christians would be better off just admitting (like the bible does, at least in parts, the bible isn’t totally internally consistent of course) that faith in Jesus takes faith. Faith meaning, you can’t prove it. Using pure rationality it seems about as fanciful as ghost leopards. Folks just choose to believe based on evidence outside the realm of reason. Feel free to disagree. These are just half-baked ideas. Perfect for the comments section. Joe Bob, thanks for your kind words in a previous comment! I’m glad you’re enjoying the site. Kuriti, thanks for your thoughts on Rudy’s essay. More importantly, thanks for your great Nic Cage feedback! I encourage both of you to keep coming back, and keep sharing. We’re on track to post plenty of stuff relevant to your comments. For example, I’m reading a new book about the history of atheism right now. I’ll post a review of it in the next few weeks. This site’s goal is to provide a forum for entertaining, and hopefully illuminating, Socratic conversations. Ideally, we’d chat with the man himself: https://www.youtube.com/watch?v=QnQ_WDtBhvI. Kuriti opens up some common points above that I have also heard from other atheist friends. One of those is (to paraphrase) that it is clear that opposing religions can’t both / all be true, and therefore we may be excused for not buying into any of them. One problem I have with this is that it treats an entire religion (quite a complex system of beliefs in most cases) as a single monolithic thing that must either be perfect; or else, should one aspect or doctrine of it fail –the whole system must entirely crumble. It could be akin to claiming that if some piece of science ever proved to be faulty, then we must abandon the entire program of modern science as worthless. I think one thing that contributes to this misconception about religion is that fundamentalists have invited it on themselves well enough with an insistence that the entirety of God’s Word (actually — no — the entirety of the modern fundamentalist understanding of God’s Word) must be free of all error. Therefore any inconsistency must either be dealt with and explained or else the whole program is fatally flawed. Hence the long game of error detectives turning up inconsistencies, closely followed by the devout to patch every hole and put out every fire by explaining why they aren’t really inconsistencies at all. And this, I think, has led to the approach that every religion is easily toppled by the revelation of just one counterexample; one flaw; one inconsistency. The trouble is, I’m not sure the majority of Christians in this country (much less the world) are fundamentalist. Most would freely admit that many errors and regrettable actions have accompanied Christianity and its sacred book, but can easily discern that no program, however worthwhile–even true– it might actually be will stay blemishless if fallible humans are involved. One other thing that you seemed to imply, Kuriti, was that one could choose to be a believer [in a religion] or not. That may be true enough, the way religion is popularly (and officially) defined. Being recently influenced by one of Ed Feser’s blogs, I would say that belief is not just a domain of officially-catalogued, organized religions, but that belief is part of somebody’s worldview (their presuppositional outlook on reality). So in that sense one cannot choose if they will believe some axiomatic things. One can only choose what it is as their starting point. And that what will be much more than just one item or detail. It will be a whole system of assumptions –even for the most die-hard self-labeled anti-religious skeptic. And this system of things may not necessarily even be consciously deliberated. But it is no less real for its embeddedness — the “spectacles behind our eyes”, as an author (Arthur Jones) recently put it. They are difficult to just take off and examine for ourselves. We tend to identify these presuppositional biases more readily in others unlike ourselves. It’s a great reason why we should listen to each other. But to think that I alone (or you alone) do not suffer from this, and that we can cooly evaluate various religions from some etherial and detached platform (“just the facts, please”) is one of the more insidious, (dare I say religious?) illusions because it is so ingrained into our thought. Religious thinkers who do freely evaluate their own bias (and embrace the impossibility of all bias ever being fully eradicated) are, I think, ahead of so many of today’s secular skeptics who haven’t even reached a self-realization in this, and imagine that they alone are free to be objective. The ones who hold their own world view out to the light to be examined, even should its flaws become apparent, are ahead of those who try to leave theirs hidden in a closet or even deny its existence. If something is in my driver’s seat, I want to know what it is. Then I may have a better chance of striving to at least get closer to that impossible ideal called objectivity. I am aware of cognitive bias and referred to it in my original post. That almost everyone in India somehow comes to the conclusion that Hinduism is true and almost everyone in the US comes to believe in Christianity is a great example of it. I agree that science is a method for creating beliefs about the world, but it is not a religion in the traditional definition. It is not dependent on a supernatural person(s) and it’s established beliefs are not sacred of themselves. As new theories arise that more accurately describes the world I encounter, I will adopt those principles (ie: the impact relativity had on scientific thought). I was sloppy in my use of the word belief as opposed to faith. I believe evolution until a better explanation for how the animal kingdom got to this current place is developed. If I ignore the new evidence and keep believing in evolution at that point, then I will be using faith (belief without evidence). We are off topic though and I am sure there will be other times to continue this discussion. Cheers! We are on the same page. Disproving god using ration is as ridiculous as proving him, so even though I continue to look at sights like these, I haven’t seen much that has changed my mind since I finished with Bertrand Russell in undergrad. The rest is just how humans can live happily. For most, that includes religion, so that means for humans, religion is probably natural. If we didn’t have it, we would invent it…just like we did the first time. An online atheist friend of mine has used this latter claim as evidence that the culture of the time must have been extremely open to the possibility of resurrection. And he also points to the speculations of onlookers that perhaps Elijah had come back, or earlier speculation by Herod that John the Baptist had come back to life. But despite these interesting points (that do need to be considered) I still think Mike has the stronger case here. If dead people were commonly thought to come back to life, then the claim would not be taken (then or now) to be such a big deal. In nearly any culture it’s going to take quite a bit of convincing if you weren’t priveleged to have been one of the first-hand witnesses. I think one of the confusions (on both sides) stems from a failure to consider that these, biblically speaking, are not all similar claims. Jesus’ resurrection is set apart as a singular and unprecedented event. So if it was a mere resuscitation as presumably the others were (they died again), then Paul’s defense of it as a “clothing the mortal in immortality” would not make much sense. There is a different category for what Jesus experienced. So it also doesn’t make much sense to speak of science attempting or failing such a task. Because in one sense science already has. People have been resuscitated. But to then compare this with resurrection in the “risen Son of God” sense is to just confuse two very different categories. Whatever one makes of some of the other claims in the Bible (were the risen saints of Matthew 27 part of some pious hyperbole?) 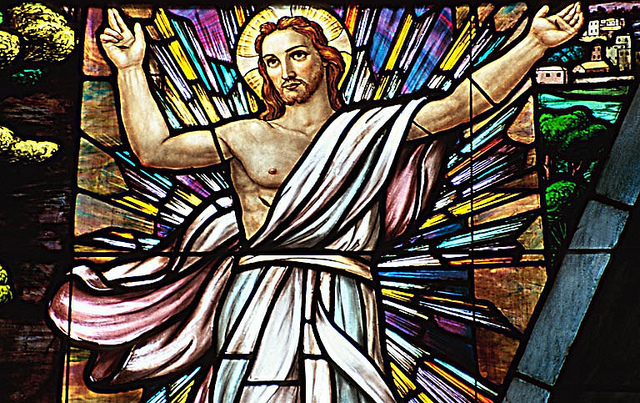 it is still an extraordinary claim about Jesus, and not one we would expect science to have any insight on, (other than to reinforce the obvious: that such things don’t normally happen) since the resurrection is presented as a singular event … for now. On a separate subject, another common mis-step that both anti-theists (which I would distinguish from mere athiests, and even more yet from agnostics) and Christians often make about each other is to misinterpret for their own advantage what the other side is claiming. Claims could be roughly sorted into several levels of strength on both sides. 1. My conviction “x” (whether atheist or Christian) is demonstrably correct and those who disagree are irrational fools. 2. My conviction “x” is probable, and my opponents are failing to properly take all the evidence into account. 3. My conviction “x” is possible; my opponents have failed to disprove it, but I can understand why they adhere to different conclusions than I do. May have more to say later about whether “religion is natural” or some interesting points of Bertrand Russell, but this has already been one long ramble. You have a great thought provoking exchange here. Merv, thanks for your thorough reply! 1) Thanks for mentioning the difference between resurrection and resuscitation. That’s a common source of confusion. 2) I also really like how you sort claims into different categories, by their strength. I hope you continue reading the blog and contributing! Very insightful. I do think we Believers forget that even people in the first century who had access to those who witnessed the risen Christ AND the empty tomb had a hard time accepting what they were hearing. Pingback: Why the Resurrection Message Is Important | When is Jesus Coming Back?